We were in Denver a couple weekends ago, staying with my sister. While we were there Will got attached to one of my nephew’s toys. 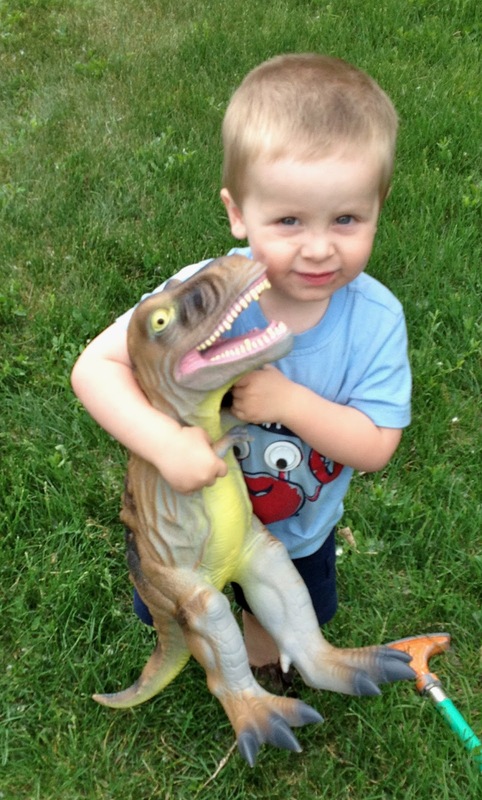 It was a big softish plastic dinosaur and he was in love with it. My sister mentioned that they were only $10 at Toys-R-Us, so we decided a trip to the toy store was in order. Of course, Will fell in love with the $20, twice-the-size version. And sometimes he’s too cute to resist, so that’s what he got. Yep, that’s Will with a dinosaur that’s almost as big as he is. His crib is a crowded place these days. I can't imagine that's very comfortable to sleep on! It definitely looks like true love. How can you NOT pack in all the animals and blankies and snuggly things at night? Even T-rexes!